This is actually a children’s book that Pipper recommended to Sophie. Pipper loves Mollie Katzen’s recipes, most of which are full of nutritious natural ingredients. Mitzi tested some of the recipes and agreed they are good-for-you delicious keepers. And just because this is a children’s book doesn’t mean adults can’t help too! The information below is from Amazon. Get ready to help with dinner for real! Are you a kid? Then this book was written especially for you. With it, you can become a fantastic cook and amaze your friends with Pita Spirals and Creamy Corn Soup or Cinnamon Swirl Sticky Buns and Best Hot Chocolate. Or you can fill your lunch bag with a wedge of Spaghetti Pie, a serving of Maple Yoghurt Fruit Dip, and a handful of Honest Pretzels that you made yourself. Are you a grown-up? 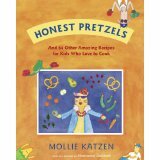 Then welcome to another very special cookbook by Mollie Katzen. In these pages she speaks directly to children through 65 fully kid-tested, illustrated recipes that require only a little adult assistance. It’s not just a cookbook full of yummy recipes–it also gives young cooks, ages eight and up, a chance to practice reading, math, and logic skills. And think of the sense of accomplishment they will feel as they grow into creative, confident chefs. Watch the video trailer now! Contact us to find out about discount pricing for larger orders and customization options. If you’re a teacher, librarian, or after-school director, go to our Activity Guide page to learn all about the engaging learning experiences during and after reading. for discounts on larger orders. Charming characters, great humor and a wonderful story. Thanks for sharing it with me. A fun way to get my kids to practice their English. I hope Pipper visits Santiago one day. 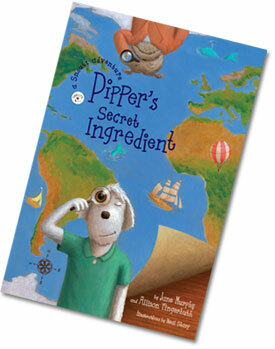 Pipper’s Secret Ingredient is a wild ride! Children will find this story fun and “delicious” while they explore exotic locales, sample culinary delights, and get exposed to varied cultures. It is rare to find a fictional children’s story that also incorporates such a heaping portion of non-fiction. The rich vocabulary and beautiful illustrations further enhance this imaginative tale. All of a sudden my son is interested in history. Thanks, Pipper! We loved reading Pipper together with our son in the evening. Not only funny for kids. There’s something for all ages. As an artist, I really enjoyed the illustrations. I highly recommend ‘Pipper’s Secret Ingredient’ to parents who want to excite their children’s imagination and to educators and librarians who use literature to tap into a wealth of learning.